MOSCOW, May 7. /TASS/. 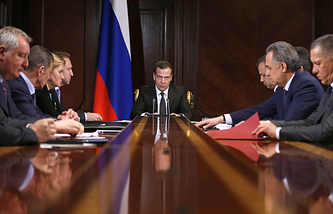 Dmitry Medvedev nominated to the Prime Minister’s office puts forward candidacies of Maxim Akimov, Tatiana Golikova, Olga Golodets, Alexei Gordeev, Yuri Borisov, Vitaly Mutko, Dmitry Kozak and Konstantin Chuichenko to positions of deputy prime ministers, a participant in the meeting of Medvedev with Edinaya Rossiya parliament members in the State Duma told TASS on Monday. The acting prime minister nominated Anton Siluanov to the office of the first deputy prime minister. Siluanov is also expected to remain the Finance Minister.